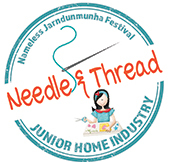 The aim of the Needle and Thread category is to encourage children’s interest and involve the creative, made-by-hand process. We would like to create an interest in the next generation about what it means to be creative and design an item by hand. ♦ All exhibits must be made from scratch and not kits. ♦ Combinations of one or both sewing techniques can be used, ie hand and/or machine sewn.